We celebrated our last babe's first trip around the sun with a sweet little family party this weekend and it was a morning to remember. We are so lucky to have had a house full of balloons, donuts, Bloody Mary's and people who have loved our girl for the past 365 days. We kept the party simple - no theme, color scheme, fancy food or decor and instead focused on how much we've all grown in the last year. To say that we don't take Georgia's smiles and giggles for granted is an understatement and watching her play with her cousins and sweet baby friends was a treat. Thank you to all of our tribe who came in to celebrate, especially my surprise arrival (video at the bottom of this post!) and the schemers behind it all! And, as a complete surprise to me, my amazing friends Ashley and Megan conspired with my husband to fly Megan in from Texas to celebrate our girl. You can see my somewhat hysterical and incoherent reaction in the video below! This past year most certainly did not look anything like we expected it to or hoped that it would but Georgia has completed our family and we just wouldn't be the same without her. Sweet girl, we wish you a lifetime of happiness, laughter and sprinkle covered donut cakes. Happy Birthday, Georgia!! She's so cute! 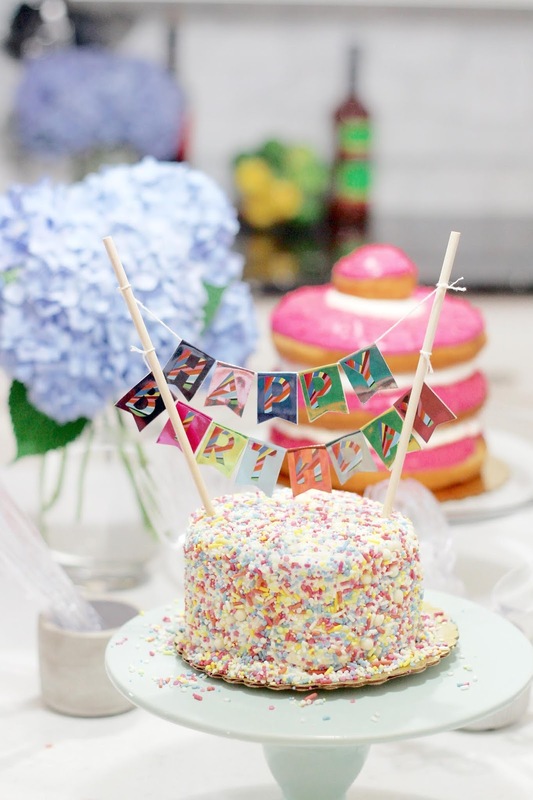 I love her sprinkle cake--I'll have to keep that in mind for my daughter's first birthday! My heart skipped a beat at that video! So sweet. Happy first birthday little Georgia! She's an adorable little one.